Flight to Socotra from Shardja (UAE) by Felix Airway. Arriving to Socotra at 9.30 am. Obtaining visas. We will drive to Ayaft gorge, a preserved area for many endemic plants. In the evening we will enjoy magnificent views of the mountains. 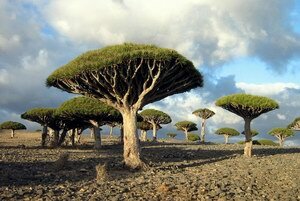 This day you will be transferred to Dixam plateau, a habitat of famous dragon trees. On our way we will see Wadi Dirhur canyon from a viewing point. After we will go down the canyon by car or on foot. Here you can swim in a natural fresh water pool. We will explore to the other side of the canyon. We will walk for 2 hours through the mystic forest of dragon’s blood trees protected by the government. We will reach the edge of the canyon, see various endemic plants of Socotra and drop in the house of the local sheik, where you can buy the famous dragon tree’s resin famous for its medicinal properties since ancient times. After swimming in the natural fresh water pool and having lunch we will drive to the southern coast of Socotra. 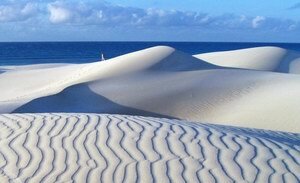 We will see beautiful dunes at a Stero place. Here you can take off your shoes and walk barefoot through the dunes to enjoy magnificent sunset. We will drive to Mumi plateau, which is undeservingly visited by tourists very rare. 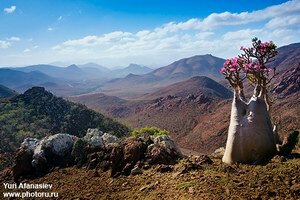 This is a remote part of the island of Socotra famous for many beautiful and mysterious places. Here we will admire flourishing odd-shaped bottle trees most of which are higher a man's height. We will drive to Kalesan gorge. Here we will admire flourishing odd-shaped bottle trees most of which are higher a man's height. We will take a 2-hour walk along the gorge floor to the biggest natural pools on the island. Mumi dolines. Sunset landscape photography. Transfer to the airport. Flight to Shardja at 13.10 pm. You can stay overnight in a Summerland hotel in Hadibo or Delisha camping where in summer there is no wind. This day you will be transferred to Dixam plateau, a habitat of famous dragon trees. In summer it is rather cold, dreary and wet on the plateau. So, you will have the unique light conditions for taking the pictures of dragon trees. After lunch we will go down the canyon by car or on foot. The walk takes about 3-4 hours and is recommended for physically active people. 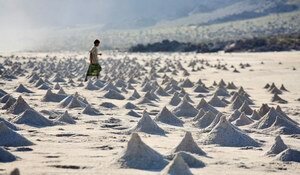 You will need good shoes to take hikes at Socotra. Except special sandals it is also good to have mountaineering boots. This night we will stay in tents at the bottom of the canyon. Here you can swim in a natural fresh water pool. However, it is warm and windless down the canyon. After breakfast we will explore to the other side of the canyon. We will walk for 3 hours through the mystic forest of dragon’s blood trees protected by the government. After swimming in the natural fresh water pool and having lunch we will drive to the southern coast of Socotra. We will see the beautiful dunes at a Stero place. We will go to the north-east of Socotra where at this time of the year you will be able to enjoy big eye-catching ocean waves washing against coastal rocks. Ras Erissel, the east endpoint of the island, is a perfect place to see large ocean waves. You can see how large dunes are formed. Trekking to Hoq cave, the largest of easily accessible caves on the island. It will take you about 1,5 hours to climb to the cave and explore it in the company of a local guide. Rental fee , entrance tickets and etc.